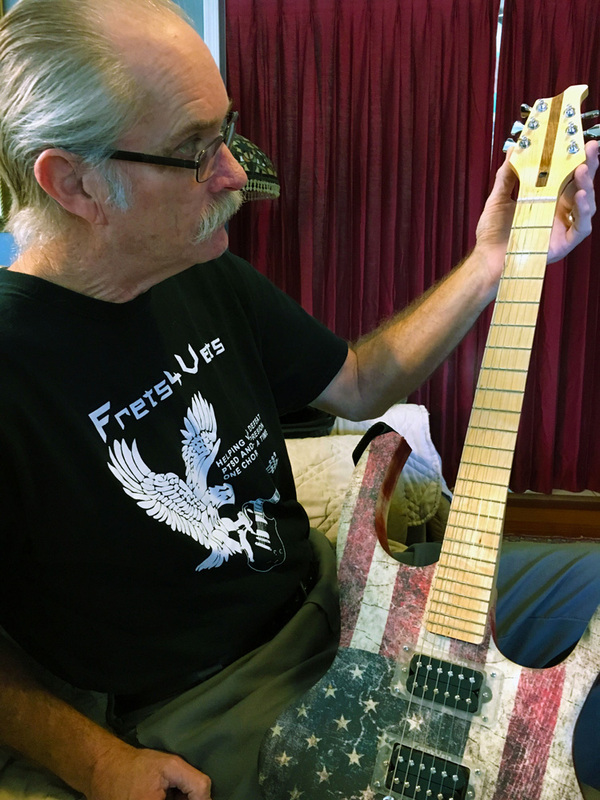 Rob Chadwich shows off his new guitar, handmade and donated by Frets4Vets, after he completed the Frets4Vets program. 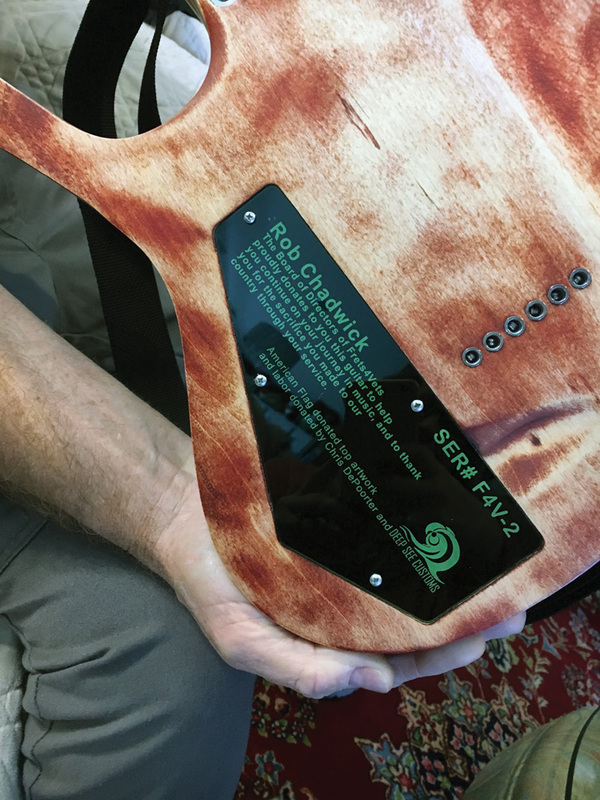 A close look at the backplate of the guitar given to Rob Chadwick. A veteran of two tours in Vietnam, Chadwick, now 71, lives near Lewes with his wife, Lorraine. He has struggled with post-traumatic stress disorder since coming home, and the after-effects of the war have impacted his daily life, according to his wife. “These guys never really came home. They survived the war, but that was it. The war’s still with them,” Lorraine Chadwick said. “There’s lots of triggers, there’s lots of nightmares,” she said. For Rob Chadwick, those triggers sometimes made it difficult for him to leave the house and made trusting strangers hard. So, guitar lessons were one of those things that fell away. Then Tom Baker and Frets4Vets came into Chadwick’s life. Lorraine Chadwick said she doesn’t remember exactly where she heard about Frets4Vets. She said she spends a lot of time on Facebook groups dedicated to helping veterans with PTSD, and that was probably where she first learned of the program. Frets4Vets is a 16-week program designed by Baker to teach veterans how to play the guitar. Chadwick — one first veterans to complete the course — recalled that the first thing Baker taught him was “how to tune the guitar,” which was a good thing, Rob Chadwick said, because he couldn’t tell if a guitar was in tune. “Could be flat as a board and I wouldn’t know,” he said with a chuckle. “I’m learning how to play the ‘Star-Spangled Banner,’” he noted. The mention of the national anthem leads him to start talking about another benefit of the program. Every participant who finishes the 16 weeks receives a guitar custom-made by Baker. Each guitar bears a plaque identifying its owner and bears a serial number — Rob Chadwick’s is number F4V-2, signifying that he is the second student to complete the program. While many of the custom-made instruments bear maps of the areas where the veterans receiving them served, Chadwick’s bears the image of a worn American flag — a design that he requested. Although Baker himself never served in the military, many members of his family did, including his father, his father-in-law and his grandmother. And his grandfather was a war photographer for President Ronald Reagan, he said. About two years ago, Baker said, “I was at a Sons of the American Legion meeting.” That’s an organization, he said, that “exists to help veterans in their daily pursuits. I was floating the idea about how music can calm people down and put them in a right place of mind,” he said. A musician since the age of 3, Baker said he knows well the focus required to learn to play an instrument. He figured that same requirement could help veterans take their minds off their memories, or their health issues. Another instructor in the program — Steve Parsons of Dover — is a bandmate of Baker’s. Their band is called Chainbreak, and Baker said they play a little bit of everything. Unlike Baker, Parsons is a military veteran, having served in the U.S. Army. Music, Parsons said, has gotten him through some rough times of his own, so he wants to pass that gift on to others. “What I believe is people want to get away from whatever the situation is. No matter how big or how small, being able to grab the guitar and go out on the porch — that’s a lot better than going to the medicine cabinet,” Parsons said. “I know what it’s like to go through a period that you have a hard time dealing with stuff. I had my guitar to help me get through some of those moments pretty easily,” he said, adding that, for him, it’s not unusual to sit down to play and have three or four hours pass before he knows it. Baker said he has seen changes in his students’ ability to cope with their PTSD that he never would have imagined. He mentioned one couple — both of whom had seen military service, and both of whom have struggled since. They called him, he said, after their ninth or 10th lesson. They told him that never would have happened without Frets4Vets, Baker said. They had never even been able to attend their own son’s Little League games because of their PTSD, he said. For Rob Chadwick, the lessons have brought positive changes in his life. Even though he’s currently sidelined with neck pain, which might require surgery to remedy, and doesn’t play his guitar as much as he’d like, he said, “I’m glad I went. I learned more than a thought I would.” He said he also wants to keep expanding his guitar skills. Frets4Vets has no shortage of veterans wanting to participate — in fact, the program currently has far more applicants than it can accommodate. There are 474 veterans on the waiting list for the program, Baker said. There is now a Dover location, in addition to the sessions at the American Legion Post 28 in Millsboro. The challenge right now is finding the $750 it costs the organization per student, per 16-week session — including the custom-made guitar. Baker and Parsons said they are hoping to find sponsors willing to help defray the cost of the program. They are also open to fundraising ideas that will help them welcome more students. The current goal is to raise $122,000, which would fund 20 students for 16 weeks at four locations. Baker said he is also looking to expand the program in to neighboring counties on the Eastern Shore of Maryland and possibly into Virginia. To learn more about Frets4Vets or to donate to the program, go to its website at www.frets4vets.org or call (302) 382-1426.